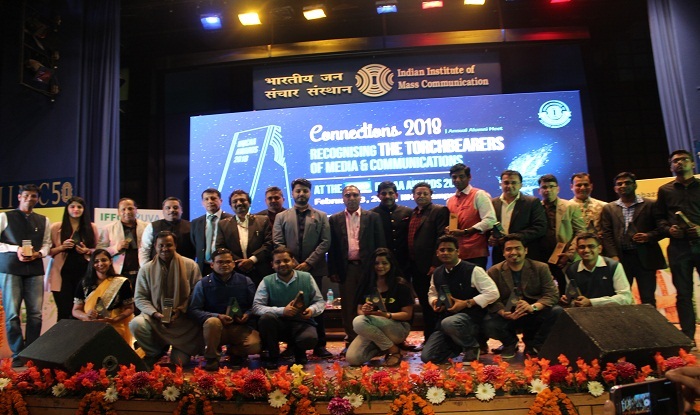 Indian Institute of Mass Communication Alumni Association (IIMCAA) announced the winners of its ‘IFFCO IIMCAA Awards 2018’ during the 6th Annual Alumni Meet – Connections 2018, on Sunday, 18th February at the IIMC HQ in New Delhi. Aaj Tak Managing Editor Supriya Prasad received Alumni of the Year Award while Delhi MLA Pankaj Pushkar was awarded Public Service Award. This was the first alumni meet in a series of 16 alumni meets in India, Tashkent and Singapore this year. Odisha Chapter will host Dhenkanal Connections on 26th February, while Maharashtra Chapter will organise Mumbai Connections on 10th March. IIMC DG KG Suresh, Uzbekistan Ambassador Farhod Arziev, IIMCAA President Suresh Kumar Vashishth, Connections Convenor Nitin Pradhan, Connections Souvenir Editor Sudhir Chaudhary, IIMCAA Awards Convenor Ashish Chakravarty, Senior journalist Brjaesh Kumar Singh, Nirmal Pathak, Utpal Chaudhary, Mukesh Sharma, Ad Guru Ramesh Tahliani, Shruti Jain, Marketing expert Sunila Dhar along with stalwarts of mass communications industry presented the awards to winners. 20 categories of IFFCO IIMCAA Awards carried a cash prize of INR 21,000 with trophy, certificate and Samsung Tablet. Agriculture Reporting Award has the highest cash prize of INR 51,000. This year, IIMCAA introduced- ‘Alumni of the Year Award’ and ‘Public Service Award’ to recognise the voice of those, whose work made noise. Supriya Prasad received ‘Alumni of the Year Award’ for bringing new trends in Television Journalism. Pankaj Pushkar received the ‘Public Service Award’ for his enormous social work in children’s education. This year, IIMCAA will host Chapter Meets in 15 cities, which include Dhenkanal (Odisha), Mumbai, Bengaluru, Lucknow, Patna, Ranchi, Guwahati, Kolkata, Hyderabad, Jaipur, Ahmedabad, Bhopal, Tashkent (Uzbekistan), Singapore and Chandigarh. Tashkent and Singapore will host first International Chapters Alumni Meets in the history of IIMC. Note- Photographs of several winners are attached in the email. If you need some specific winner photo, kindly ask us. IIMC Alumni Association (IIMCAA) is a registered body under the Societies Act. IIMCAA boasts of strong alumni from Journalism, Advertising and Public Relations stream, since 1965. On the third Sunday in February every year, IIMCAA organises its signature event – Connections at IIMC HQ in New Delhi. The grand alumni meet is followed by series of alumni meets at other centres. In 2017, IIMCAA introduced IIMCAA Awards to recognise the achievements of alumni in various fields of mass communications. IIMCAA has 15 Chapters and Four Sub-Chapters across the country. It also has international chapters in Australia, Singapore, Uzbekistan and the United Kingdom. Established in 1965 during the pre-television era, the Indian Institute of Mass Communication (IIMC) is among the oldest communication schools in India as well as in Non-Aligned Movement (NAM) countries, which has shaped the development of India’s vibrant media & communications industry. Today, it is ranked among the top mass communication institutes across Asia. Functioning under the aegis of the Ministry of Information & Broadcasting, IIMC plays a pivotal role in training professionals for the communication sector and has produced some of the finest journalists, advertising and communication professionals in the country. IIMC trains the probationers of Indian Information Service (IIS) and communication professionals of other developing countries as the part of India’s bilateral commitment.